This past Saturday I started the first step on my long journey to a first batch of sake. Sake, just like beer, is a grain based alcoholic beverage where starch is enzymatically broken down into sugar which is subsequently fermented by Saccharomyces into alcohol. The big difference between beer and sake (besides the lack of hops) is that malted barley contains the enzymes necessary to convert its starches into sugars, while rice cannot perform this trick on its own. Luckily long ago the Japanese discovered that a certain strain of mold is capable of the crucial first step of creating sugar. 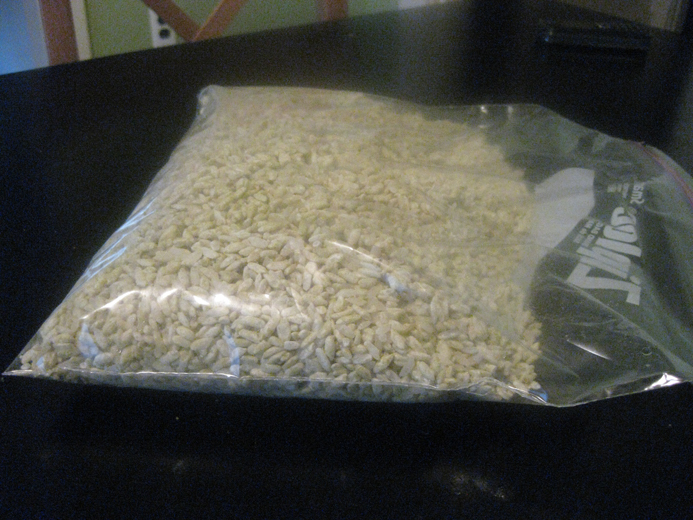 While you can buy koji (rice covered in the amylase producing mold Aspergillus oryzaegilis) I decided it would be more interesting to inoculate rice with the spores (which can be purchased at many larger homebrewing stores). I've only dealt with mold a couple other times on this blog, most notably while making Camembert cheese. Mold (a fungus just like yeast) needs oxygen and moisture to grow, air is an easy source of oxygen, but controlling the humidity can be tough at home (luckily I found a pretty easy solution). 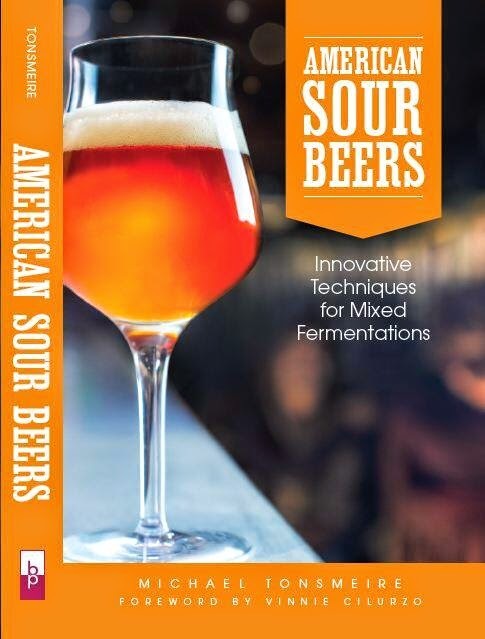 Before describing my rig and technique, I'll suggest that if you want a complete guide with all the details, history, tricks, variations etc... check out the excellent Taylor-MadeAK - Brewing Sake guide, where I learned about the process and equipment required. Bob Taylor also did a good interview with Basic Brewing Radio a few years back, and seems to know more about making sake than anyone else here on the internet. This series of sake posts will only cover the steps I take, I'd suggest you read through his full guide if you want to try making sake at home. 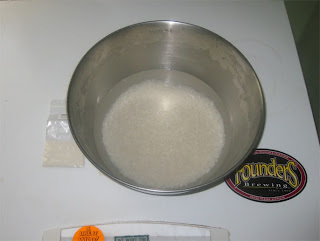 The first step to making koji was to rinse 3.5 cups of short grain sushi rice in cold water until the water ran clear. This removes surface starch and promotes good grain separation (giving the maximum surface area for the mold to grow on). After 5 hours (as little as 1 would have worked) I drained the rice in a sieve for 30 minutes, to partly dry the surface, which further encourages separate grains. 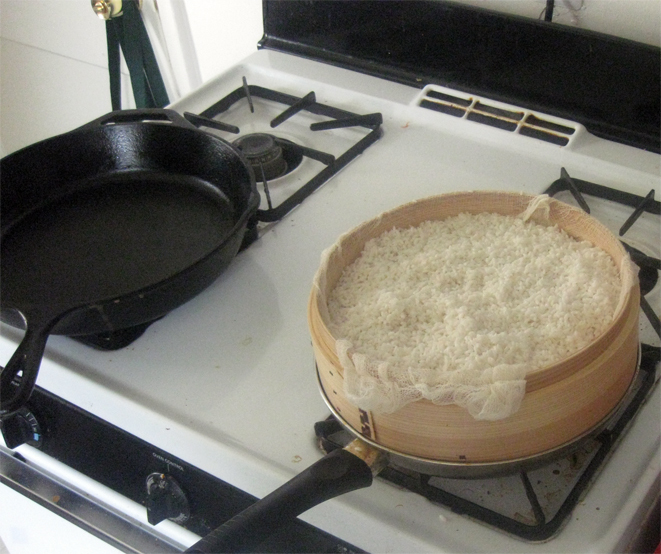 I steamed the soaked and drained rice for 45 minutes using a bamboo steamer (a present from my sister) lined with cheesecloth. The pan I was using ran out of water near the end of the cooking, but the rice still seemed cooked through (if a bit chewy). For the rest of the rice steamings required to make my batch of sake I've been using a pot that can hold enough water to last 45 minutes without a refill. The cooked rice needed to be cooled, I did this by dumping it into a chilled Pyrex baking dish and giving it a stir every few minutes. After 20 minutes the rice was down to 80 degrees. I then sprinkled .5 tsp of the spores over the surface of the rice using a small fine-mesh strainer. Once the spores were distributed I stirred, then repeated twice more for a total of 1.5 tsp of spores. The heat/humidity rig I constructed consisted of the rice filled Pyrex baking dish placed on top of a heating pad, all housed inside my large cooler mash tun (luckily I have an old heating pad which does not have an auto-off). 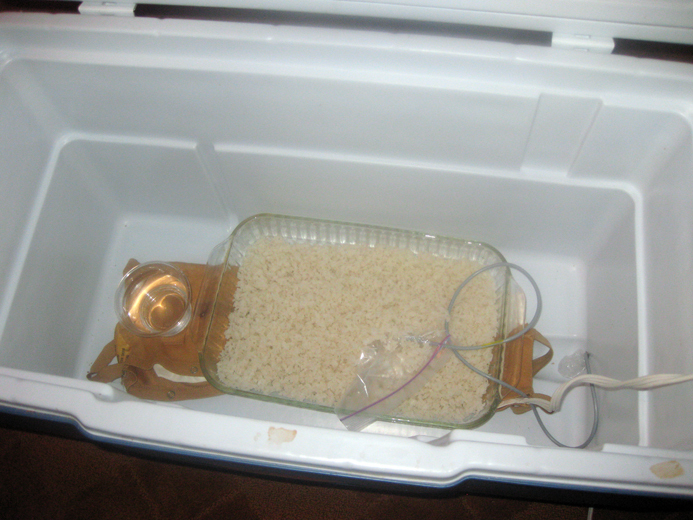 Ideally the mold/rice should be held at 96 degrees, so I wrapped the probe of my digital temperature controller in plastic wrap, and stuck that inside a Ziploc baggie and buried it in the center of the rice. It took me a few minutes to figure out how to switch my controller from cooling to heating mode, but I eventually figured out the instructions and moved the pins to the correct configuration. For added humidity I placed a small plastic cup of water on one side of the heating pad. I came back every 10 hours for the next 50 hours to mix the rice with my clean hands. After 20 hours I saw (white, slightly fuzzy) and smelled (funky/nutty/cheesy) the first signs that the mold was growing. By 50 hours each individual grain was pretty much covered with the off-white mold, signaling that the koji was finished. When I tasted a few of the grains they had a distinct sweetness, a good sign that the mold had produced the needed enzymes. It goes almost without saying that if you see any black/red/brown/purple mold you need to toss the batch out and start over. At this point I sealed up the koji in a plastic freezer bag and put it in the fridge. Over the next few weeks I'll be slowly building the batch of sake with additions of koji, steamed rice, and water. Hopefully the rest of the process will be as smooth as this first step. Thanks for the shameless plug and embarrassing compliments, man. My wife is cracking up at how red I am over that whole "knows more about sake than anyone else on the internet" business. (*~.~) How embarrassing! I get enough embarrassing complements about my sour beer brewing, I just have to give other people the same treatment when it comes to their specialties. Don't be modest, most of the other recipes I see on the internet for sake are table sugar wine with "rice flavoring"… yum. Is it a bad sign that my Moto seemed to be fermenting already before I added the yeast? Hopefully I wasn’t too loose with my sanitation. Nah. That's to be expected with a yamahai moto type starter. You're just seeing some wild yeast and - more importantly - lactobacillus partaking of the feast. You want that to happen because the acidity generated here is going to be required later on to balance the sake and keep the pH low enough to discourage other spoilage critters. Mike, really interesting post. I have all of next week off so maybe I'll have to pick up some new hobby like this! Racked first batch today. Looked right smelled right tastes VERY sour! How sour is it? If it is really sour and not just tart then it sounds like lactic acid bacteria got into the sake. How long has it been aging for? What was your fermentation temperature throughout the moromi fermentation? I got some yellowish color at some of the koji? Do you think it is infected? Can I used it? I am growing the koji in wood boxes and since I am doing so! I get the yellowish color. At least not that white as before! I guess it is because the wood. By the way, how do you clean the Wood? Mike, thanks for the quick reply! I will connect with Taylor then. I am doing the koji with the koji buta boxes and I am not getting the same exact color! I hope the sake turns fine! If your koji is white with a yellow tinge, then it's okay to use. The color is just an indication that the koji is a bit further along in maturity than is usually used. As I see since I am using the koji buta, the koji is done before 48 hours. Your recommendation is to stop growing koji when it starts appearing the yellow color? my Koji came out yellowish as well. Is that normal? it's furry and does have "Some" white covered rice, but mostly yellow fuzziness. Can I still use it? I made the first batch, got scared and threw it away, but the second batch did the same thing. I had it grow for 56 hours because I wasn't sure if it was just a slow growing batch or something. I have bagged it, and placed it in the refrigerator until I can figure out if I did it right. The comments above from Taylor-MadeAK sounds like its fine. Not an area of expertise for me! The Taylor-madeak site appears to be down? Good sake brewing information has become widely available. For this reason, I felt that the Taylor-MadeAK.org website has served its purpose and have decided to retire it.